We’re not just bringing savings in to the new year – we’re bringing BONUSES too! Members will be receiving Double XP (Adventure, Tradeskill, & AA) and Double Guild AND Personal Status. But remember, status received from items purchased from vendors or the Marketplace does not double. But hurry! 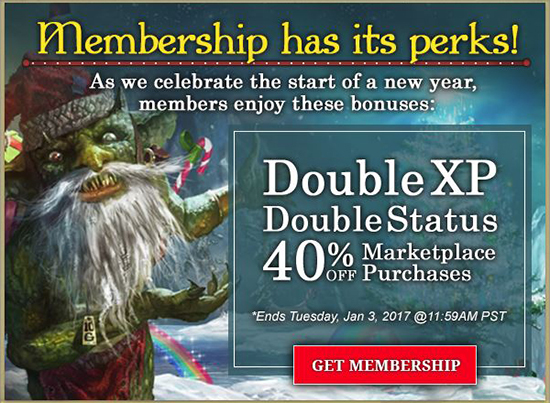 The sale & bonuses will only last until Tuesday, January 3, 2017 at 11:59AM PST (~NOON) PST. Enjoy the sale, Norrathians, and Happy New Year! There is no better time to be a member! Want to learn more about all of the perks of All Access Membership? Click here! *40% off discount does not apply to Krono, Expansions, or Memberships. We’ve verified that Server Transfer Tokens ARE included. ^lot of people feeling that way lately.